For The Venezuelan Opposition, Protests Are 'Like A War' Venezuela has been in political and economic turmoil for months. Daily demonstrations, food shortages and a crackdown on the opposition have forced the country into a near state of collapse. A crash in oil prices and political instability under President Nicolas Maduro has led to food shortages. And that has prompted almost daily street protests by thousands of Venezuelans. 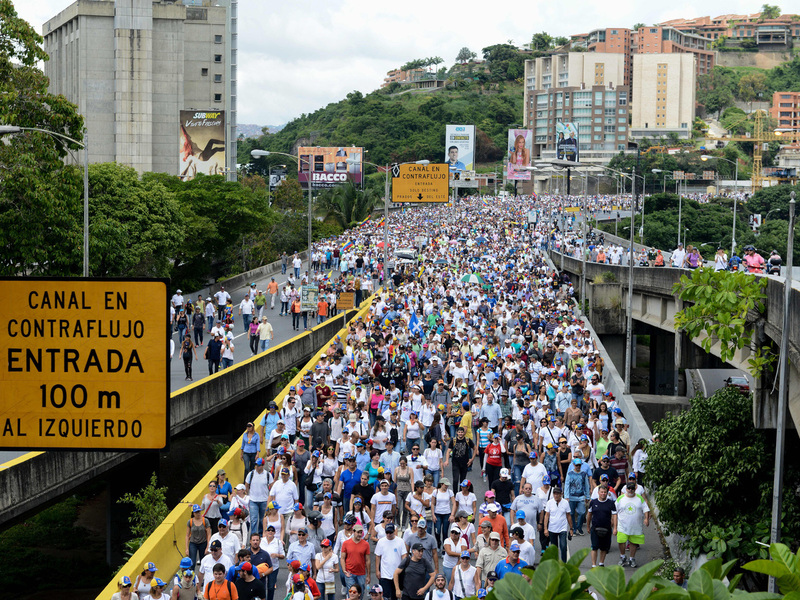 Here opposition activists march on the Francisco Fajardo Highway in Caracas on June 19. "I cannot find basic food: no rice, no chicken. Fruits are very expensive. So what has really shocked me is that this past year, you can see on every street of the city, there is someone in the garbage looking for food," he says. Carlos had been a tour guide until the spring, when he joined the opposition protesters, which the government considers enemies of the state. With the collapse of the economy, Carlos says tourism has pretty much dried up. These days the protests in Caracas — Venezuela's capital — are practically his full-time job. As described by Carlos, the protests are extremely organized. Protesters, he says, are divided into levels. "There's level 1 to 7," he says. Level 1 protesters are up front, face-to-face with police. People call them warriors. "These are kids, most of them under 25, which are students most of them — or they have nothing to lose, they don't have a job, they don't see a future and they fight for their life," he says. Carlos mostly hovers in the second wave of the protest. He says these are people who help with logistics. There, he passes out water and snacks and pours Maalox over the faces of protesters who are weeping with tear gas. He gets the food through a network of people who operate more or less anonymously, sharing information through messaging apps about drop-off points and pickup spots where they are hiding supplies. Opposition activists clash with riot police during a demonstration against the government of President Nicolas Maduro along the Francisco Fajardo Highway in Caracas on June 19. "It's like a war. There are soldiers, there's [logistics], there's intelligence. It's like a Cold War as well because we're hiding," he says. "I'm walking down the street, and I'm scared some policeman might [catch] me because now if you have a helmet in your car or a baseball hat of the flag of Venezuela — which is like the symbol of the protest — they can put you in jail." 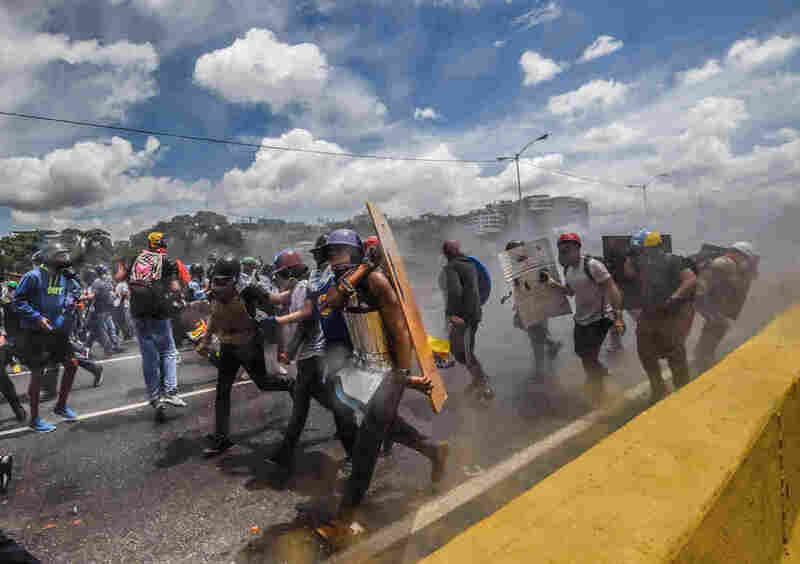 More than 70 people have died in protests that have roiled the country since April, after Venezuela's Supreme Court moved to dissolve the National Assembly. And the protests have taken on new urgency now that Maduro has plans to rewrite the country's constitution. Protesters believe he's trying to cement his hold on power. Carlos says protesters want new elections, the release of political prisoners and access to humanitarian aid. Shannon O'Neil, a fellow at the Council on Foreign Relations, tells NPR that Maduro has the support of between 20 and 25 percent of Venezuelans. Many, she says, are people who are getting baskets of food through a program arranged by the government. "There is this base of support, though we have seen it eroding as this crisis gets worse," she says. The U.S. has issued sanctions on Venezuelan leaders and has reached out to other countries in the region to try to bring together a coalition to push for change. But, as O'Neill says, such moves can bolster Maduro's anti-U.S. rhetoric. In a televised speech last month, Maduro said to "go home, Donald Trump. Get out of Venezuela, Donald Trump. Enough interventionism." "That rallies his loyal followers. If you can blame the problems of Venezuela today not on your policies but on the United States, it serves him well," O'Neill says. She says some people hope the government will collapse — and others fear it because that could lead to more economic hardship — and a refugee crisis. "We've already seen tens of thousands of Venezuelans flee to neighboring countries to look for a better life, to get basic health care, to find food, and there's a worry that you could see those levels increase dramatically if Venezuela and the government collapse." The number of Venezuelans seeking asylum in the U.S. has more than doubled in the past year. All Things Considered editor Emily Kopp contributed to this story.